Fig. 1. As of 2016, field methods were modified in order to ensure the collection and state-of-the-art analyses of sensitive palaeo-environment data from the workrooms and industrial units sealed under collapsed walls and roof materials in the middle wing. The Department of Antiquities of Cyprus (Ministry of Transport, Communications and Works) announced the completion of the University of Cyprus 2016 field project in the economic-administrative citadel of Ancient Paphos at Kouklia, under the direction of Professor Maria Iacovou (Department of History and Archaeology, Archaeological Research Unit, University of Cyprus). 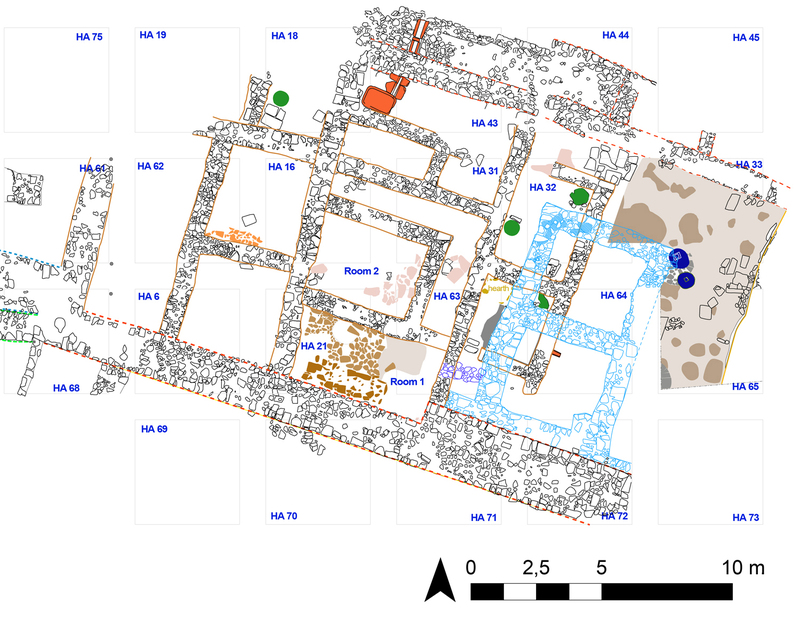 The 2016 excavations were conducted in two phases between May and October on the plateau (citadel) of Hadjiabdoulla, which houses an extensive storage-plus-industrial complex of the Cypro-Classical period, and on the nearby impressive man-made mount of Laona. Both monuments were unknown prior to the initiation of the Palaepaphos landscape analysis project (2006-2016) by Professor Maria Iacovou. The plateau of Hadjiabdoulla (east of the sanctuary of Aphrodite) seems to have functioned as the centre of the royal dynasty that ruled the city-state of Paphos until the end of the 4th century BC. The stone-built complex under investigation extends over 65 m. along the plateau’s northern edge. It consists of stepped terraces built down the slope; it is subdivided into production and storage units by means of long cross-walls and parallel retaining walls. As of 2016, field methods were modified in order to ensure the collection and state-of-the-art analyses of sensitive palaeo-environment data from the workrooms and industrial units sealed under collapsed walls and roof materials in the middle wing (fig. 1). This new approach has been successfully initiated thanks to the effective collaboration developed with the specialized Wiener Laboratory of the American School of Classical Studies in Athens. Samples were taken for micro-morphological studies, and mud-brick, wall plasters, phytolith and starch analyses, while the students were trained in the selection process of bio-data by palaeo-botanist Dr Anayia Sarpaki and anthracologist Dr Maria Ntinou. Besides agricultural products (olives, grapes, wheat etc. ), whose handling and storage in the complex is now confirmed, the excavation team has come across a surprising discovery of primary significance for the economy of the ancient polity: a thick layer of crushed murex shells was found lying on the floor of one of the units (fig. 2). It is the first time that archaeological data confirm the production of this precious and expensive purple dye (produced from murex shells) in Cyprus. In 2012, geological and archaeological investigations conducted within the framework of the Palaepaphos project confirmed that the Laona mount (fig. 3), situated 75 m. north of the Hadjiabdoulla complex, is a man-made tumulus of significant dimensions (100×60 m.). Its summit rises to 114.20 m. above sea level (almost 10 m. above the natural hillock) (fig. 4). The tumulus is a mortuary monument built in order to preserve the memory of renowned individuals, but it is extremely rare in ancient Cyprus. This and its unusual construction of thick horizontal layers of marl alternating with layers of red soil, make the Laona tumulus a special if not unique monument in the Cypriot landscape. Contrary to the red soil, which could be collected from the surrounding surfaces, marl had to be quarried from its geological environment, and then transported (probably, by means of carts) to where the mount was raised. It has been estimated that the construction of the tumulus required 9.888 cubic m. of marl and red soil. The ceramic material collected from the red soil layers allows us to suggest that the tumulus was erected in the 3rd century BC. It is, therefore, likely that this labour demanding monument, was related to the political program of the Ptolemies. Ptolemy Soter had taken over Cyprus at the start of the 3rd century BC and had proceeded to eliminate the island’s autonomous city-kingdoms. Investigations carried out in the SE quarter of the mount revealed a much older monument that had been preserved under the layers of marl. It is a rampart running north-south, so far excavated to a length of 42.5 m. Two staircases facing each other, whose state of preservation is so far unparalleled, must have been leading to towers (fig. 5). The rampart was founded at 107,20 m. above sea level; its northern section, which rises to 112 m., is preserved to a height of 5 m. However, since the inner face is made of layer upon layer of mudbricks (fig. 6) which, when exposed, deteriorate fast, the excavators decided to uncover only a small section. The ceramic material isolated in the foundation trench between the two staircases suggests that the rampart was constructed late in the 6th c. BC, probably towards the end of the Cypro-Archaic period. Due to the sensitive character of the excavated materials, the Department of Antiquities has applied preventive preservation and protection measures that have rendered the staircases and the mudbrick walls invisible.